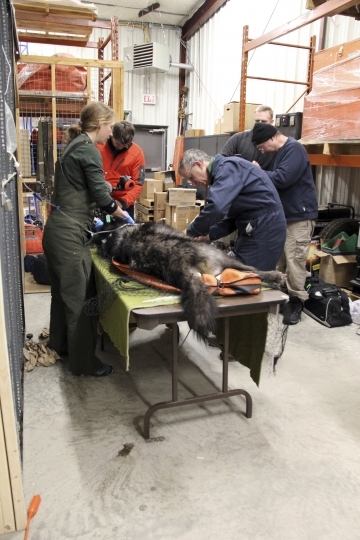 TRAVERSE CITY, Mich. — Four Canadian wolves have been relocated to Isle Royale National Park in Michigan as part of an ongoing effort to restore the predator species on the Lake Superior island chain, officials said Monday. 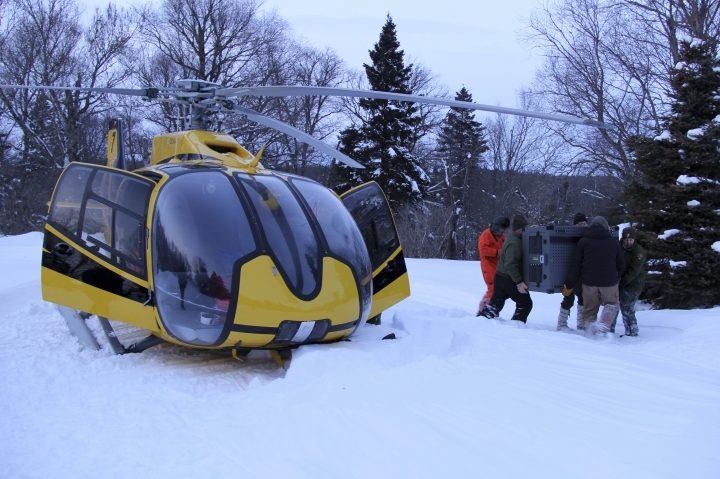 Helicopter crews fired net guns last week to capture a female and a male near the mainland city of Wawa, Ontario, and two males on Michipicoten Island Provincial Park in Lake Superior. 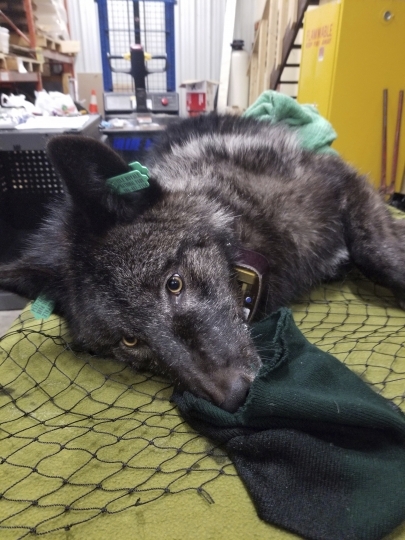 All four were sedated and examined by veterinarians before being flown to snowbound Isle Royale, where they were given another checkup and released, the National Park Service said. Like others brought to the island last fall, they were fitted with radio transmission collars enabling scientists to track their movements. Each wolf arrived separately over several days. "I am ... blown away by the resilience of these wolves, who within hours after undergoing capture and handling and arriving on Isle Royale, immediately got on the trail of their pack mates," said Mark Romanski, the park's natural resources division chief. "These large males, all around 90 pounds (40.8 kilograms), will almost certainly know what to do when they encounter a moose." The translocation boosted the park's wolf total to eight — four males and four females — including the last two survivors of a dwindling population that had occupied the park for about 70 years. Four were moved from tribal land in Minnesota to the park last fall. Of those, one died and another made its way back to the mainland across an ice bridge in February. 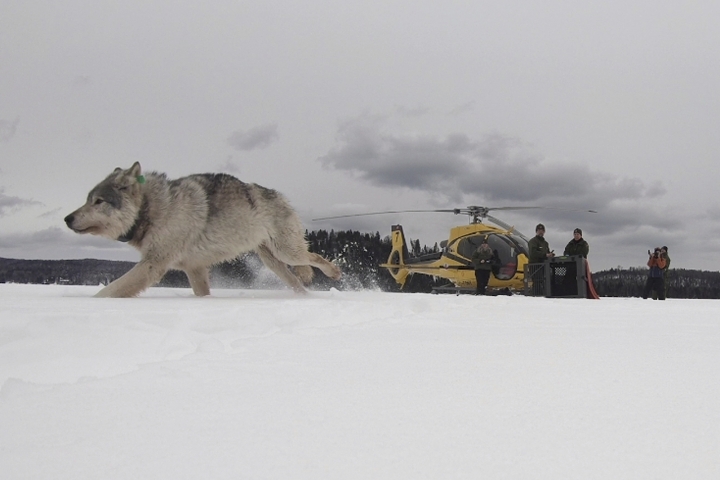 The National Park Service hopes to take 20 to 30 wolves to Isle Royale over several years. They prey on moose, which have boomed in the decade since wolves began their steep decline, now totaling around 1,500. Scientists say if the moose aren't kept in check, they'll over-eat the island's trees and shrubs, harming the environment and setting themselves up for mass starvation. Plans call for selecting wolves from numerous packs in Minnesota, Canada and Michigan's Upper Peninsula to provide genetic diversity and prevent the inbreeding that was primarily responsible for the population slump. "The relocation of Ontario wolves to Isle Royale National Park demonstrates our mutual commitment to conservation and we are happy to help Michigan restore balance to the island park," said John Yakabuski, head of the Ontario Ministry of Natural Resources and Forestry, which led the capture mission. Winter storms prevented the operation from taking place until a break in the weather last week. 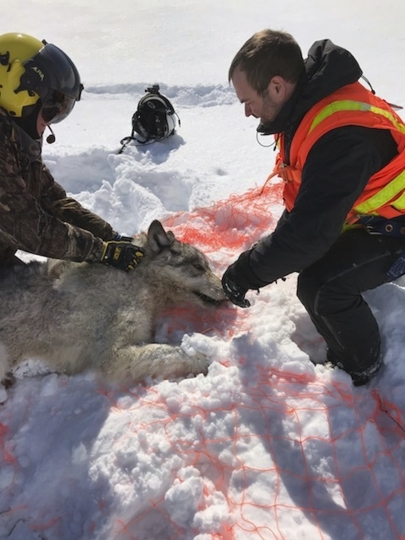 One of the wolves nabbed on Michipicoten Island was the alpha male of a pack that has decimated its caribou herd after crossing ice from the Ontario mainland several years ago. The Ontario ministry and the Michipicoten First Nation moved 15 of the remaining caribou to two other Lake Superior islands last year. No more wolves will be taken to Isle Royale this winter, park spokeswoman Liz Valencia said. About 90 percent of the lake's surface is frozen after a prolonged siege of bitter cold, according to the NOAA Great Lakes Environmental Research Laboratory in Ann Arbor, Michigan. Valencia acknowledged that could tempt some of the newly arrived wolves to return to the mainland as the Minnesota wolf did in February. "That's part of the gamble," she said. "But these are farther from their home territory than the wolves last fall. So it's less likely, based on science, that they'll try to return — but not impossible." Cell service at Rainier: Do you want to hear me now?